We went to Johnny Mango for an early Sunday Brunch this past Sunday. Johnny Mango is a small place in Ohio City that we have been wanting to go to forever. It has a nice casual vibe with not many people there as we were there by 9:30 AM. I had their whole wheat waffles with a plum/lemon sauce. They were excellent. Courtney had a chorizo, potato and cheese omelet and Sophia and Grace each had a breakfast quesadilla. They are known for their fresh made juices. Sophia and Grace each had a huge orange juice that they gulped down and I tried the apple, cranberry and ginger that was great as well. We will definitely try to go again when we are in the neighborhood… hopefully for their Taco Tuesday and margaritas. After breakfast we sent for a quick walk through the zoo as we were down the street and it was a beautiful fall morning. Other than the hundreds of people walking around for a diabetes walk, it was a nice to be out and about. 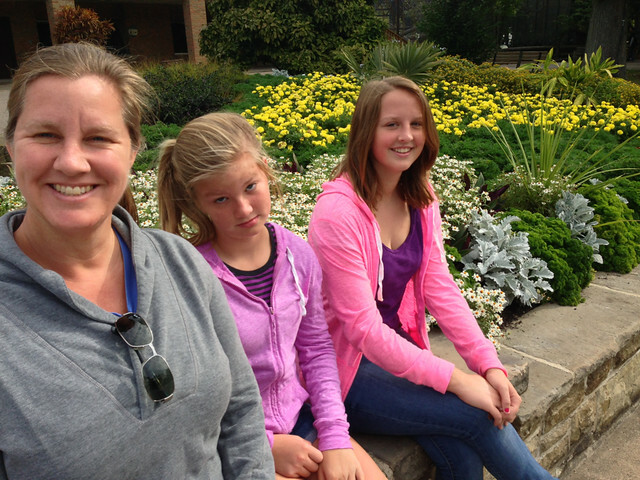 Courtney, Sophia and Grace enjoying the fall morning and late summer flowers at the zoo. I like the parsley in the border.